Citation: Abdullayev N, Maus V, Neuhaus V, Christoph K, Borggrefe J, et al. Spontaneous remission of Vogt-Koyanagi-Harada Meningoencephalitis. J Clin Radiol Case Rep 2018, Vol.2 No.1:01. Copyright: © 2018 Abdullayev N, et al. This is an open-access article distributed under the terms of the Creative Commons Attribution License, which permits unrestricted use, distribution, and reproduction in any medium, provided the original author and source are credited. We describe a 65-year-old patient with Vogt-Koyanagi-Harada (VKH) syndrome and primary malignant melanoma of the trunk presenting with systemic tumor progress and new contrast-enhancing intracranial lesions without neurological symptoms. While the systemic melanoma disease ultimately was in progress, the correct radiological interpretation of brain lesions as intracranial manifestation of VKH was mandatory to prevent the patient from unnecessary whole brain radiotherapy. 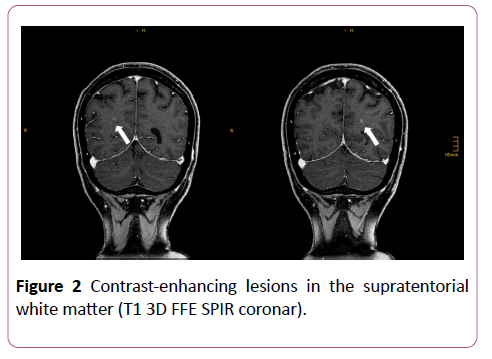 Figure 1: Leptomeningeal contrast enhancement of the pons and T2 hyperintense lesions in the right cerebral peduncle (left-T2 TSE coronar, right-T1 3D FFE SPIR coronar). Treatment of melanoma remained unchanged and further control-MRI of the brain after 2 months showed absence of contrast enhancement with regressive T2 lesions. New contrast-enhancing lesions were present in the supratentorial white matter (Figure 2). Figure 2: Contrast-enhancing lesions in the supratentorial white matter (T1 3D FFE SPIR coronar). Mediastinal melanoma masses showed remission on CT. Morphological findings and clinical course were deemed atypical for brain melanoma metastasis and accepted as cerebral manifestation of VKH syndrome. Probatory steroid therapy was recommended, but rejected by the patient. Nevertheless, a further 3-months control-MRI of the brain demonstrated complete remission of all contrast-enhancing lesions and slight residual T2 hyperintensity in the cerebral peduncle (Figure 3). Melanoma metastases were dramatically progressive on CT during unchanged therapeutic regimen. 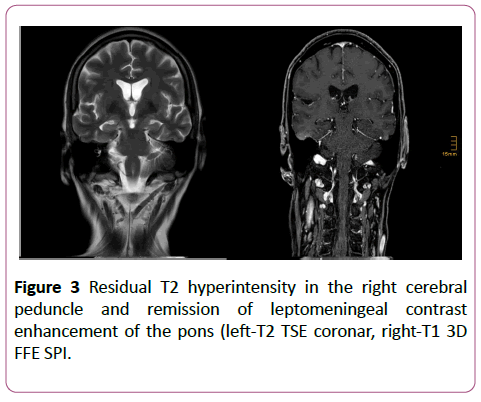 Figure 3: Residual T2 hyperintensity in the right cerebral peduncle and remission of leptomeningeal contrast enhancement of the pons (left-T2 TSE coronar, right-T1 3D FFE SPI. VKH syndrome is a granulomatous inflammatory disorder mainly affecting tissues containing pigmented cells (ocular, auditory, integumentary). Patients often present with vitiligo, alopecia, auditory signs, and meningeal irritation . Th1 and Th17 CD4+ lymphocytes seem to play a pivotal role in the pathogenesis of VKH disease . The natural history can be divided into 4 stages: prodromal, acute-uveitic, chronic, and chronic recurrent and is characterized by bilateral uveitis with multifocal retinal detachment and iridocyclitis. The involvement of the central nervous system is rare and may be associated with focal neurological signs . Neuroimaging (MRI) is mandatory to confirm intracranial manifestation of VKH, although abnormal MRI findings have been reported in a few cases only. Early reports described diffuse leptomeningeal contrast enhancement and T2-bright periventricular lesions, while more recent ones described lesions within the brain stem and peduncle as well as pachymeningeal enhancement [4,5]. We here present a patient with progressive malignant melanoma and VKH syndrome exhibiting multiple new contrast-enhancing cerebral lesions and leptomeningeal enhancement with spontaneous remission. Interestingly, our patient showed a very late onset of leptomeningeal involvement without neurological symptoms, although abnormal signal changes and pathologic contrastenhancement were located in the right cerebral peduncle. Hashimoto et al. described similar changes mainly in the posterior fossa as preferred localization . In the present case, the opposed systemic course of the progressive melanoma disease under continuous immunotherapy in contrast to the initially new-onset intracranial lesions, that finally resolved spontaneously, led to the correct interpretation of these findings. In conclusion, cerebral manifestations of VKH in patients with primary malignant melanoma have to be delimited from melanoma metastasis as misinterpretation of clinical and MRI findings may lead to erroneous treatment, e.g., whole brain radiotherapy. Read RW, Holland GN, Rao NA, Tabbara KF, Ohno S, et al. (2001) Revised diagnostic criteria for Vogt-Koyanagi-Harada disease: report of an international committee on nomenclature. American Journal of Ophthalmology 131: 647-652. Moorthy RS, Inomata H, Rao NA (1995) Vogt-koyanagi-harada syndrome. Survey of Ophthalmology 39: 265-292. Nitta E, Takamori M (1989) Wallenberg's syndrome in a case of Vogt-Koyanagi-Harada disease. Rinsho Shinkeigaku Clinical Neurology: 29: 505-508. Lohman BD, Gustafson CA, McKinney AM, Sarikaya B, Silbert SC (2011) MR imaging of Vogt-Koyanagi-Harada syndrome with leptomeningeal enhancement. American Journal of Neuroradiology 32: E169-E171. Han HJ, Kim HY, Park JH, Lee EJ, Kim DG, et al. 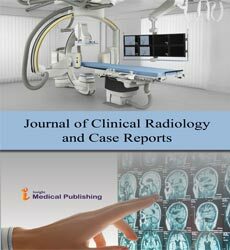 (2010) Magnetic resonance imaging of pachymeningeal enhancement in Vogt-Koyanagi-Harada disease. Neurological Sciences 31: 785-788. Hashimoto T, Takizawa H, Yukimura K, Ohta K (2009) Vogt-Koyanagi-Harada disease associated with brainstem encephalitis. Journal of Clinical Neuroscience 16: 593-595.